Microsoft released a new Windows 10 Insiders Preview Build 18317 to the insiders in the Fast Ring. 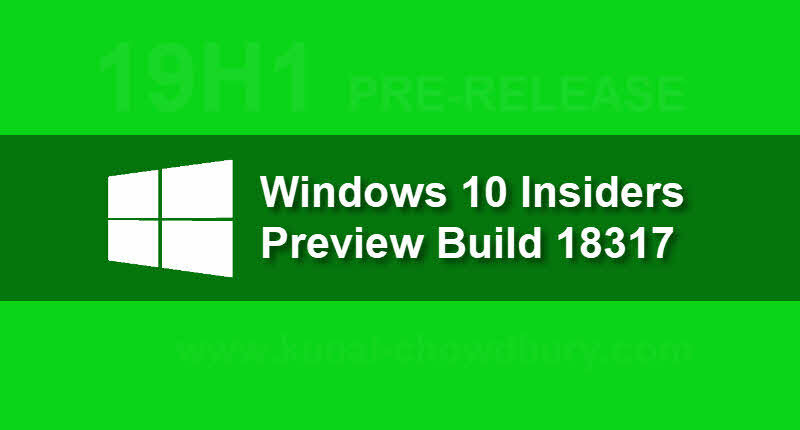 The new build, released on 16th January 2019, includes some enhancements to Windows 10 which we are expected to see in April 2019 feature release. Along with the new enhancements, the build also includes few known issues. Make sure to check the release notes before upgrading to this build. With the release of Windows 10 (19H1) build 18317, Microsoft separated the Search and Cortana in the taskbar. According to Microsoft, this will enable each experience to innovate independently to best serve their target audiences and use cases. Clicking the search box in the taskbar will provide you an unified search experience. Until today, the Start in Windows 10 was hosted by ShellExperienceHost.exe. With the new build 18317, Microsoft separated it into its own process called StartMenuExperienceHost.exe, which will provide a set of benefits to the end user. Microsoft also making some changes to the Font Management in Windows 10 build 18317. Users will be allowed to drag and drop font files from the File Explorer to the fonts settings page to install them. After installation, you can click on the font in the Font settings page to view the different font faces associated with the font. Insiders will now see a simplified Windows Insiders Program Settings page. According to Microsoft the simplified experience is to make the end-to-end experience of signing up for the Windows Insider Program and setting up your PC to take new builds much easier. If you have come this far, it means that you liked what you are reading (Latest Windows 10 build 18317 (19H1) separates Search and Cortana from Taskbar, includes new improvements to Start, Font Manager).